Scaffold Marlborough works closely with many local trade companies, fitting scaffolding to suit the site. This ranges from aluminium mobile towers to custom erected scaffold. It can be used as interior platforms for things such as painting ceilings, to scaffolding around the exterior of houses for builders, roofers, plumbers and painters. However the scope of scaffolding doesn't stop there, as detailed in our case studies. Dance and musical theatre are also making use of the added security of having certified scaffolding as part of their productions. Hidden by scenery facades, performers can work at height using platforms and stairwells in safety without compromising the integrity of the performance. No need to "break a leg.." now! Scaffold Marlborough has supplied equipment for productions such as Blenheim Musical Theatre's Chicago, and The Marlborough Theatre Company's production of Cats. 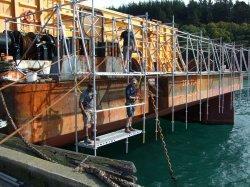 Commissioned by Cuddons Engineering, we constructed the scaffold on the back of the Sea Tow barge. Welders could then safely fit a new towing rail to the exterior of the barge while it remained in the water at Picton Harbour, saving the time and expense of putting the barge into dry dock to get the maintenance work done. Talk to Rob now, for solutions to your scaffolding needs.